This story was told by John Laughton, second mate on the Hobbs Victory cargo ship, and written by his wife Lorna in the middle 1960s. He is referred to as "Big John" in the story, because he was called that by some on his ship. Captain Izant had left orders for an early morning call believing that this might very well be the day for setting sail toward destination "X." It was Easter Sunday, 1945, and it was near 0600 local apparent time as the merchant ship S.S. Hobbs Victory, swinging at anchor in the Ulithi Atoll, awaited orders to proceed to its undisclosed destination. This United States merchant vessel had left its launching only six weeks earlier from Richmond, California. She was brand-spanking new, and nothing could make her or her crew take a back seat for fitness. The second mate, Big John, as he was appropriately called by the entire crew, had the four to eight watch and thus drew the duty of directing his look-out man to calling the cooks for the galley while he attended to arousing the skipper. This accomplished, he directed Whitey, the A.B. (Able Seaman) attached to his watch, to lower the starboard motor lifeboat to the main deck level for the possible last mail call pickup at the island some three miles away. Later while morning chow was being consumed amidst curiosity and anxiety, Captain Izant was still in the ward room with most of the other ship's officers having their second cup of coffee. Big John swung down from the flying bridge and interrupted excitedly, "Captain, here's a message that just came in from shore. Flags caught it on the blinker." Scanning the message form hurriedly, the Skipper said as a happy grin crossed his face, and his burly eyebrows lifted, "Now hear this, men; this is from the convoy commander on the island. He directs the armed guard lieutenant and me to come ashore immediately for convoy grouping information and other matters pertaining thereto, and he suggests that a full head of steam be brought up on the boilers." "It looks like this is what we've been waiting for." "Big John, have yourself relieved from watch, get some chow, and be ready to take the lieutenant and me to shore in fifteen minutes." "Yes Sir!" replied the second mate as all the officers scrambled out to take care of last-minute preparations. The trip to the island was as speedy as a motorized whale boat could handle while the waiting time for mail pickup and the convoy meeting was even less. In less than two hours from the time that the early morning message was received the anchor was weighed, and the Hobbs Victory was under way taking number seven spot in a convoy of seven ships. "Where does destination 'X' take us, Skipper," asked Big John in the chart-room as they got into position and headed for open sea. "The scuttlebutt Flags picked up from the flat-top this morning was correct about the invasion of Okinawa," replied the Skipper. "That's where we are headed; so here's our routing. Plot our course from the coded check points in case we get separated from the convoy. If all goes well we should arrive on the morning of the fourth." "Very well, Sir," answered Big John happily as he went to work laying down the course in the direction of the new battlefront in the far Pacific. The next two days out from Ulithi were normal and uneventful. On the evening of the second day "Sparks," the chief radio operator, Gordon Brown, picked up a severe storm warning message stating that a hurricane was headed in the direction of the convoy. By the next morning the fringes of the storm were upon them. The convoy commander ordered the course altered thirty degrees to starboard, which meant that if they stayed on the course very long, delay on arrival was inevitable. By nightfall the waves that had been long and rolling in the morning had turned into greater heights with white-caps churning wildly on their crests. Midnight found the convoy possibly two hundred miles east of the eye of the hurricane. All ships must have been shipping green water over their bows inasmuch as the lookout man on the Hobbs was forced from the bow lookout to the flying bridge. This made it more difficult to stay in convoy position because of very poor visibility. Sleep was impossible for the off watch crew as the ship listed, pitched, rolled, and vibrated throughout when part of the propeller stuck its blades above the waterline. On the morning of the fourth day, the convoy with speed cut in half was still heading in a northerly direction instead of northwest, and the wind remained constant at one hundred knots. By noon the wind was down somewhat from its peak, and on the change of the 1600 hour watch all seven ships were still in sight. Speed was increased and the course altered 80° to due west. Two days overdue and six days out of Ulithi, landfall was made in a group of very small islands five miles south of Okinawa. These tiny islands, referred to as Kerama Retto, were situated as to form a natural enclosed harbor for the U.S. naval fleet in the area. The Hobbs Victory with her six companion ships pulled into the anchorage and dropped its hook. "Looks like we're in luck for protection, Big John," drawled the armed guard lieutenant. "There's the Indianapolis on our inshore side and the New Mexico on our offshore side." About fifteen minutes after the lieutenant's remark, Flags received a message by blinker to the effect that all merchant ships carrying explosives or gasoline will proceed out of their present anchorage to one around the smallest westerly island. Now here was the Hobbs Victory with a cargo of some six thousand tons plus of ammunition destined for the army just five miles north of here. With the firepower protection of two score U.S. "Man of Wars" all around their present anchorage, the Pierre Victory, Logan Victory, and the Hobbs Victory must now proceed to an area almost unprotected as far as firepower was concerned. By the time the move was completed it was 1500. The furnaces were banked for a minimum amount of steam in the boilers, and the watches were doubled by the armed guard for maximum lookout. A navy LCM pulled alongside and her captain hailed captain Izant. "Is everything okay, Skipper?" asked the Lt. Commander. "Aboard ship, yes, but how come the orders from SOPA (senior officer present afloat) ordering us over here? We're a sitting duck in this area," retorted Captain Izant. "Don't worry," returned the commander, "all has been quiet here for four days. Your own guns will give you all the protection you need," he continued. "It's only a safety precaution that you were moved out of the fleet area so as not to endanger them in case you were knocked off near them. We'll be around in the morning about starting to discharge your cargo." "Okay, commander, see you in the morning; thanks for the information." The skipper threw him a salute as the LCM pulled away. Thirty minutes had passed when all hell broke loose; Jap suicide planes came out of nowhere it seemed. One was a Zeke that crashed into a navy LST loaded with barrels of fuel oil causing it to become a complete inferno. The other was a Betty, which came straight in toward the fantail of the Hobbs. This twin-engine enemy plane looked like a two-story building bearing down at the stern of the ship when a top-notch gun crew opened fire with all it had – a five inch 38 aft, four 20 mm along each side, and a three inch 51 forward. The five-inch projectiles puffed explosions right in front of the nose of the plane as it came in. These caused the Betty to take a 90° turn to the left and head for the broadside of the Pierre Victory, which was still unalerted because of the quick attack of the enemy. Just 200 yards from the Pierre the 20mm crew on the port side aft on the flying bridge of the Hobbs brought down the plane into an easy roll and into the drink. Captain Izant came running from the chart room, through the wheel house, and on to the port wing of the bridge catching Big John by the arm and shouting, "Hurry, on the double! Get hold of the chief engineer and tell him to get up a full head of steam. We're getting out of here." Big John swung into the wheel house, whistled the engine room, and got the Chief on the other end. "Chief, this is second mate," he exclaimed. "Skipper says bring up sufficient steam to get underway as soon as possible. Ring us on the telegraph when you're ready, got it?" the second mate continued. "Okay," answered the Chief. Just as Big John rushed out to report to Captain Izant, he witnessed another Zeke coming in on the Logan Victory, hitting her broadside amidship, and for a split second, all waited for her to blow sky high. Instead, boats, rafts, etc., blew into the air. The ship's cargo, which was ammunition, did not blow up immediately because the plane hit her amidship. The Skipper contacted the First Mate and directed him to pull the pin in the anchor chain locker room, thus losing the anchor to Davy Jones' locker, but at the same time saving valuable time for a slow heaving to of the anchor by the electric windlass. By the time this was accomplished the telegraph from the engine room had responded to stand by. In a record time of some seventeen minutes the black gang had worked feverishly to bring a cold engine plant to full steam, ready for whatever the bridge asked of them. The attack continued while the four to eight watch was on duty with Big John standing by the telegraph taking orders from Captain Izant who paced from one wing of the bridge to the other. "Slow ahead," ordered the Skipper. "Slow ahead," responded the second mate as he swung the handles of the telegraph all the way to that position. There was a moment of breathless waiting for the engine room to respond before they answered by the indicator on the telegraph. "Helm amidship," ordered the skipper. "Helm amidship," Big John directed Whitey, the A.B. at the wheel. Whitey swung the wheel to the center line and responded to the second mate, "Helm is amidship, Sir." "Very well," answered Big John who in turn shouted out to the wing of the bridge, "helm is amidship, sir." "Very well," said Captain Izant who then ordered full ahead and directed the maneuvering of the ship out of this anchorage. Before clearing the last tiny island the Hobbs' guns were still busy firing at what appeared to be another Zeke hovering in the shadows of the island and getting ready to make a run on the ship. All guns on the port .side opened up on the plane as it tried to gain altitude and in so doing showed its insignia to be one of the U.S. Navy's own Hellcats. Just then the Lieutenant ordered all guns to stop firing but not before the plane was hit and its pilot had bailed out to safety. The Hobbs Victory with its cargo doomed to boom was still afloat and heading for open sea once again, trying to elude these kamikazes if at all possible. This had been a busy day, arriving at the fleet anchorage at 1000, moving to another anchorage, coming under enemy attack, seeing two ships close by get sunk, and seeing the gun crew scratch two planes from the sky – one an enemy plane and one our own. By the time the Hobbs cleared Kerama Retto it was 1800 (6:00 p.m.). No enemy planes had been spotted for some fifteen minutes when suddenly two Zekes were seen flying high and out of range almost directly above the Hobbs, but they went on south. Attention and guns swung in the direction of the fleet anchorage as a Betty was trying to sneak in on the fleet; however, it didn't have a chance as the fire power of the Navy ships was so terrific that the twin-engine kamikaze just disintegrated in mid-air. In the meantime the second mate on the port side of the bridge had not lost sight of the two Zekes seen earlier overhead for they were splitting up down south, and it looked as though one had decided to attack the Hobbs. Taking no chances the second mate hurried through the wheel house to the starboard side and reported same to Captain Izant, who was making sure that the ship would clear a shallow shoal off the last island. "Notify the Lieutenant, quick," the skipper ordered Big John, who was already up the ladder to the flying bridge where the Lieutenant was directing gunnery operations. "There's a Zeke four points off the port bow, Lieutenant," shouted the second mate, "just picked him up!" "Thanks, Big John," replied the Lieutenant, "keep your fingers crossed." All guns on the port side swung about as well as the 3" forward and the 5" aft. There was silence for some five seconds, and then via the intercom the Lieutenant ordered, "Open fire." The next twenty seconds seemed an eternity as the Zeke came in some thirty to forty feet above a fairly smooth sea, swinging like the end of a pendulum, trying to elude the gunfire pouring its way. Tension aboard this bucket of dynamite was at an all time high. Mouths were dry, and prayers were uttered as the 20 mm tracers poured into the Zeke. Alas! Smoke poured from the underside of the plane, but it was too late for the momentum carried the kamikaze through the radio shack, where Gordon Brown was on duty. Concussion knocked everyone to the deck; smoke, steam, and fire billowed out of the engine room. Fire enveloped the after part of the midship house and number four hatch. No explosion came other than in the engine room. It seemed a miracle that the ship was still afloat. Orders flew fast and furious, and the injured were laid in the two starboard lifeboats as both port side boats were shattered by the impact of the Zeke. Casualty counts were out of the question because the concussion had blasted some of the off-duty watch over the side; others had tripped the life rafts and jumped in after. This was just as well, because by the time the remaining survivors loaded both boats, little room would have been left for more. Captain Izant remained until the last boat pulled away. The Hobbs was still under way and unable to be stopped because of complete knockout of the engine room; so the Captain slithered down a Jacob's ladder into the sea and was picked up by Big John in the motor lifeboat. "You okay, Skipper?" asked the chief engineer as he helped pull him into the boat. "Sure, sure, Chief, but let's get out of here," the Skipper answered. Hopefully he asked, "Were you able to get into the engine room at all?" "Not a chance; it was a real inferno," expressed the Chief sorrowfully. As darkness was closing in, the motor lifeboat made its way to the other lifeboat to take it in tow and head for shore some five miles away. Rescue boats from shore met the survivors coming in and did a tremendous job of finding those still in the water. Not until midnight did it become apparent that of a total crew of ninety-nine, thirteen would never been seen again. And so it was that at that hour the Hobbs Victory with its cargo doomed to boom did just that. Comment by John Laughton (February 11, 1979): My memory fails me at this date of the thirteen who were killed except to say for fact that all 5 in the engine room (the 2nd engineer, an assistant, a water tender, an oiler, and a wiper), the chief radio assistant, the deck cadet, 3 armed guard crewmen, and three more who I can't remember were killed in the attack. Thanks to Steve Laughton, son of John Laughton, for contributing this story. 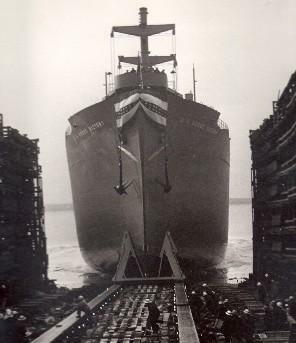 S.S. Hobbs Victory was one of 531 Victory cargo ships built for use in World War II. A Victory ship was 455 feet long and 62 feet wide, and it could reach a speed of 15 to 17 knots. In addition to the sinking of the Hobbs Victory and Logan Victory by kamikaze aircraft attacks on April 6, 1945, one other Victory cargo ship (Canada Victory) sank due to a kamikaze attack on April 27, 1945. Three other cargo ships were sunk by kamikaze attacks. These were the following Liberty cargo ships, which were sunk in the Philippines: William S. Ladd (December 10, 1944), John Burke (December 28,1944), and Lewis L. Dyche (January 5, 1945). The end of the story does not clearly describe when and how Hobbs Victory finally sank, since the crew abandoned ship several hours before she actually went down. Sources vary in their descriptions of what eventually happened to the cargo ship. Rielly (2010, 219) states, "She continued to burn through the night until she blew up at 0300 the next morning and sank." Hoyt (1983, 274) describes the demise of Hobbs Victory and Logan Victory: "The crews abandoned in a hurry, but the ships floated around the harbor for a whole day. No one dared come near. They burned and their ammunition went off in crackling bursts. Finally they were sunk by naval gunfire." Warner (Warner 1982, 189) states: "A fireboat fought the fire for four hours before the explosions forced it away. Eventually the exploding Hobbs Victory had to be sunk by gunfire." Stern (2010, 199) provides the following description of the sinking of Hobbs Victory and Logan Victory: "Both broke their moorings and drifted near the harbor entrance all night, on fire and erupting periodically as parts of their cargo ignited. Both were sunk by gunfire the next morning."